August 21, 2001, L. G. Crabo. 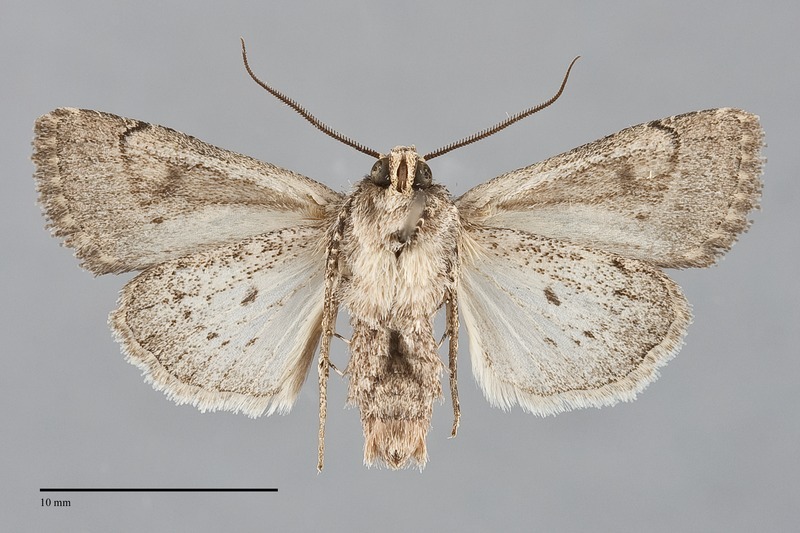 Protorthodes alfkenii is a small (FW length 12 - 14 mm) mottled dark gray-brown moth with a slightly oval black orbicular spot, a gray-filled reniform spot, gray veins on the distal wing, and a pale hindwing with a dark margin that flies commonly across southern Oregon during the fall. The forewing is slightly powdery medium-dark gray-brown, slightly darker and grayer on the costa and distal to the postmedial line. The veins are covered with light and dark scales, appearing mostly darker than the ground color, especially distal to the median area. The basal and antemedial lines are gray, double filled with the ground color, evident as dark and light spots on the costa and usually indistinct elsewhere. When evident, the basal line is drawn toward the base on the cubital vein and the antemedial line is smoothly excurved with notches toward the base on the veins. The median line is gray, a diffuse oblique line medial to the reniform spot and faint or absent elsewhere. The postmedial line is similar to the antemedial line on the costa, variable elsewhere, absent, a double gray line, or a series of dark and light spots on the vein lateral to the line, drawn toward the base on the costa, forming a tight convex curve lateral to the reniform spot, and nearly straight from the mid-cell to the posterior margin, often touching the lower reniform spot. The subterminal line is pale yellow-tan, irregular across the wing, preceded by a dark gray-brown shade and sometimes a few dark spots between the veins on the mid-wing. The terminal line is a series of small gray spot. The fringe is gray-brown, sometimes with tan checkering of the base. The orbicular spot is outlined in gray to black, oval, filled with light gray and a gray-brown ocellus. The reniform spot is usually weakly hourglass-shaped, slightly tilted toward the base anteriorly, incompletely outlined in gray and a light shade of the ground color or light gray, filled with dark brown-gray. A faint small claviform spot is sometimes present. The hindwing is pale whitish basally darkening to medium-dark gray at the outer margin, with dark gray discal bar, veins, and terminal line. The hindwing fringe is white with a gray base. The head and thorax match the forewing color. The eye is sparsely covered with very fine hairs. The male antenna is weakly bipectinate. This species can usually be recognized in its southerly range during its fall flight season by its small size, dull mottled dark gray-brown color, small oval ocellate orbicular spot, gray-filled reniform spot, irregular subterminal line, and pale hindwing with a darker gray margin. It resembles Orthodes noverca, a species that flies until late August. It has a black outline of the inferior orbicular spot and has lighter filling of the reniform spot than on the adjacent wing, features not evident in P. alfkenii. Its hindwing is also darker gray. Anhimella contrahens and Anhimella pacifica have gray-brown forewings with dark-filled spots. The antemedial and postmedial lines are usually better defined than those of P. alfkenii, their subterminal lines are more obscure across most of the wing, and their hindwings are pale with much weaker marginal gray than in P. alfkenii. 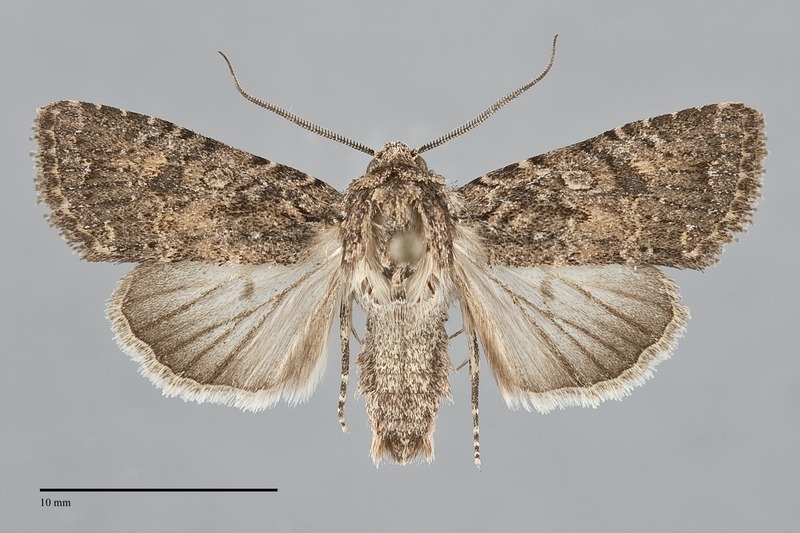 The uncommon moth Sympistis goedeni that flies with P. alfkenii in the Siskiyou Mountains is superficially similar but lacks hairs on its eyes. Its orbicular spot is oval without light gray around the periphery, and its postmedial and subterminal lines are more irregular than those of P. alfkenii. This species is widely distributed throughout the southwestern United States in grassland and riparian habitats. In the Pacific Northwest, it is mostly restricted to wet meadows around marshes, lakes, and the riparian zones along creeks and rivers at low elevations east of the Cascades. West of the Cascades, it occurs in dry grasslands, oak savanna, and in oak woodlands at low elevations in southwestern Oregon. Protorthodes alfkenii is found in southern Oregon in the Pacific Northwest. The range extends to the south slope of the Blue Mountains in the southeast, and to the southern end of the Willamette Valley in the western part of the state. This moth reaches its northern range limit in our area. It is widespread throughout California, the Intermountain region, and desert Southwest to the southern Great Plains in Colorado and west Texas. This species appears to be a generalist feeding on many kinds of herbaceous vegetation. The flight period of P. alfkenii is the fall, usually beginning in mid-August and lasting through September. This species is nocturnal and comes to lights.